This is where European civilization began during the era ruled over by the powerful King Minos. This is a place that simply and strangely disappeared, only to be discovered again by the English archaeologist Sir Arthur Evans. Now partly reconstructed, the blood-red coloured columns and gigantic double-headed axes are a vivid reminder of this forgotten and long-lost race.The Palace of Knossos, with its construction, the use of luxury materials, amazing architectural plan, advanced building techniques and impressive size, is a monumental symbol of Minoan civilization and culture. It was built between 1700 and 1400 BC and was first discovered in 1878 by Minos Kalokerinos and excavated by Sir Arthur Evans in the 1900s. 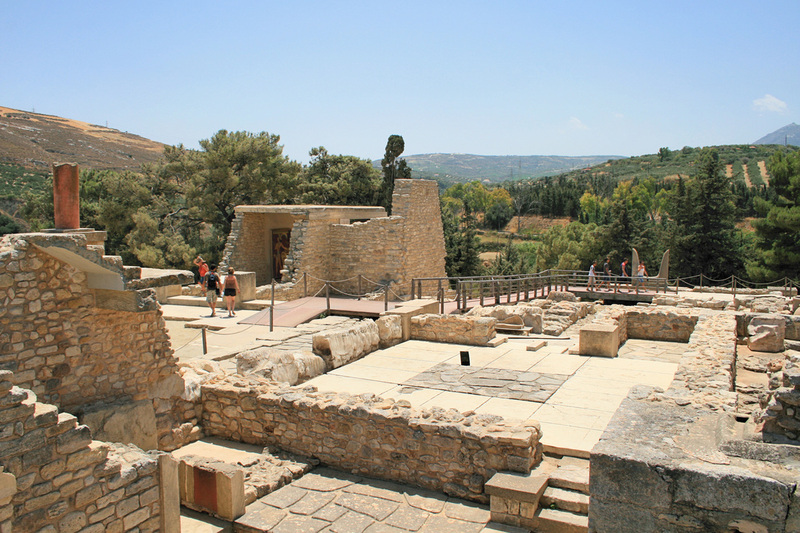 Knossos Palace is the largest and the most spectacular of all the Minoan Palaces in Crete. It has an area of 20,000 square meters and has a labyrinth-like design with 1200 rooms and a big courtyard in its centre. The variety of building materials used and the marble facade show a surprisingly advanced level of technology. This is also demonstrated by some architectural and structural features, such as the light-wells and the complex drainage system, as well as the water-supply systems. You can enjoy the Corridor of Processions, the Horns of Consecration, the Queen’s Boudoir and you will be told the Legend of the Minotaur and the Bull Dancers. When we leave the palace, we will visit the newly renovated archaeological museum which houses artefacts from all periods of Cretan prehistory and history, covering a chronological span of over 5,500 years from the Neolithic period to Roman times. The singularly important Minoan collection contains unique examples of Minoan art, many of them true masterpieces. The Heraklion Museum is rightly considered to be the museum of Minoan culture par excellence worldwide.